That was over 30 years ago. Since then, I got married and moved to Alaska. I made sure to marry a guy who loves to travel as much as I do and is happily willing to let me handle all the logistics of trip planning. On our first overseas trip we went to Canada from Alaska. We landed in British Columbia and then tool the ferry out to several of the Southern Gulf Island. We cycle through the islands staying at B&B accommodations. There was so much that I didn’t know about international travel. I spent a lot of hours on the Internet researching everything! I was determined not to book a tour and just travel on our own itinerary. This style of traveling is known as Indy (independent) Travel. This type of travel takes a great deal more time to organize than just booking through a tour company and having them dictate when, where, and how long you can stay in a location. But the rewards are worth it. We have since traveled independently to Ireland twice, Nepal, Cuba, all over the Caribbean on scuba vacations, Spain, and Mexico. Once you’ve decided on a country to visit there are several steps that you need to follow in order to plan a successful trip. Conditions are always changing with advances in technology, and airport security being stricter than ever. I’ve compiled a list of 7 of the most essential things you need to consider prior to your first international vacation. 1. Do I need a passport for international travel? The short answer is yes. If you are leaving the US you will need a passport. There was a time, before 9/11, that all you needed to enter Canada was a valid drivers license. Those days are long gone and if you want to ever leave the US you will need to fork over the money and get a passport. Fortunately, the process for getting a passport is not complicated. Simply go to this government website: https://travel.state.gov/content/passports/en/passports/apply.html and follow the directions. The site is easy to use and guides you through filling out an application that you then print out and take to one of the accepting facilities. The easiest place seems to always be the post office. You will need to have passport photos (follow their guidelines or the application will be rejected), proof of citizenship (a certified US birth certificate or a Certificate of Naturalization), valid government issued photo ID, and the fees. They take checks, credit cards, money orders, etc. But not cash. They will return whatever you submitted for proof of citizenship in a separate envelope from your passport. I had to send my original Certificate of Naturalization and believe me, that had me worried. So relax and go with the flow. Normal processing time is usually 6-8 weeks. You can pay extra for an expedited passport, but that still takes 2-3 weeks. Plan well ahead of your trip. At the time of writing this post the total cost for one passport is $135. The site will tell you what the current fees are but it hasn’t really changed that much in years. 2. Do I need a Visa to enter a foreign country? At this time, for most countries in Europe, you don’t need a visa. Things may change going forward and it’s best to check the State Department’s website to see what the requirement is. In most cases if you do need a visa, you can get one upon arriving in the country and paying a fee. But for other countries you may need to obtain one ahead of time. A destination like Russia for example, requires an entry visa to prior to arrival. I also recommend visiting the website for your destination country’s embassy. They will have updated information and more details. 3. Should I register my international trip with the US State Department? 4. How do I get cash in a foreign country? Easiest way to access cash in developed countries is to just go to an ATM machine. Underdeveloped countries have ATM machines too but they may be harder to find. Do your research ahead of time and find where the banks are located along your destination. Make sure you have a chipped debit card if you don’t opt to go with the Schwab card. More on that below. Don’t use your credit card to withdraw money unless it’s an emergency. Getting cash using your credit card is considered a “cash advance” and is charged interest by the bank as such. Cash advances for credit cards are normally well above 12% ! Your personal bank’s debit card is what I’m referring to here. But that is fraught with problems too. First of all, if it’s stolen and hacked, your checking/savings account at home can be emptied in minutes. So what do you do? I suggest getting a Schwab debit card. For years I used my personal debit card in foreign countries and never had an issue, but I was always worried about losing it or having it stolen. The Schwab card isn’t tied to any personal account. It has NO foreign transaction fees AND it refunds you any charges that the ATM machine says it’s going to charge you for using it. I wrote a post about it here: The Best NO Fee ATM Card For Travel I suggest you read it and make your decision. Just don’t wait until the last minute. It takes a few days to open an account and a few more to have the card mailed to you. Then you have to load it with money and that takes 5 business days every time. So be sure to look into getting this at least 2 months prior to your trip. Remember: When you request cash in a foreign country you are going to get foreign currency. The amount you request has to be in that currency. This is where the exchange rate comes into play. 5. What’s the currency exchange rate? The ATM machines will ask you what currency you want to be charged in. You need to always choose the local currency because (unless you are using a Schwab debit card) you will be charged an exchange conversion fee. It’s a scam to earn the bank money. This is why it is important that you know how to convert money yourself and request the correct amount. For example: You are in Mexico and you want to withdraw the equivalent of $200 from an ATM machine. As I write this, the exchange rate is $1 USD to 19 Mexican Pesos. So I know that I would get about 3800 pesos. All US credit cards are chipped now. The issue is that we are using the chip & signature system. Not the chip & pin system. The difference is actually simple. European and other countries around the world have chip & pin cards which means that they insert their card into the machine and then get prompted for a pin number and the transaction is completed. American cards don’t have this feature. The pin number that you can get with your credit card is for cash advance withdrawals at a bank NOT for using during a standard credit card purchase. But don’t worry, they have adapted to us rebellious Americans. They know how to tell their system that they are dealing with an American card and it then prints out a little slip of paper to sign. The whole time we were doing this in Spain last year, I kept imagining that the waiters were thinking: “Really? The most powerful country in the world still hasn’t figured out the chip & pin system”? Yeah, thank you to the American banking system for that one. Just like getting money out of an ATM machine, when you charge things on your credit card you will be asked whether you want to be charged in Dollars or the local currency. ALWAYS, ALWAYS choose the local currency. If you don’t, you will be charged for the conversion. I think many major credit cards have now gone to no foreign transaction fees, but check with your bank. Oftentimes this is only a courtesy given to premium cards. I can tell you for sure that the following cards have no foreign exchange fees: Chase’s United Mileage cards, Alaska Airlines branded Visa Signature card, Capital One and certain AMEX cards. 6. Can I use my cellphone overseas without paying a fortune? Yes, if you do it right. The cheapest and easiest way to use your own phone is to just buy a SIM card for the country you are visiting. You can do this online through a variety of online retailers, or wait until you are on the ground to buy one. Stores that sell SIM cards can be found in almost every major airport and certainly in retail stores in the town you are visiting. I opt to buy mine online so that I have a working phone as soon as I land. I like to be able to check flight information in my connecting cities, email, and call the Airbnb or hotel if needed. It’s a few dollars cheaper to buy the card once you get to the country you are visiting, but for the extra few dollars I prefer the peace of mind of having it on hand. They have good plans that cover almost the entire world and very good customer support. I used them in Spain last year and it worked perfectly. 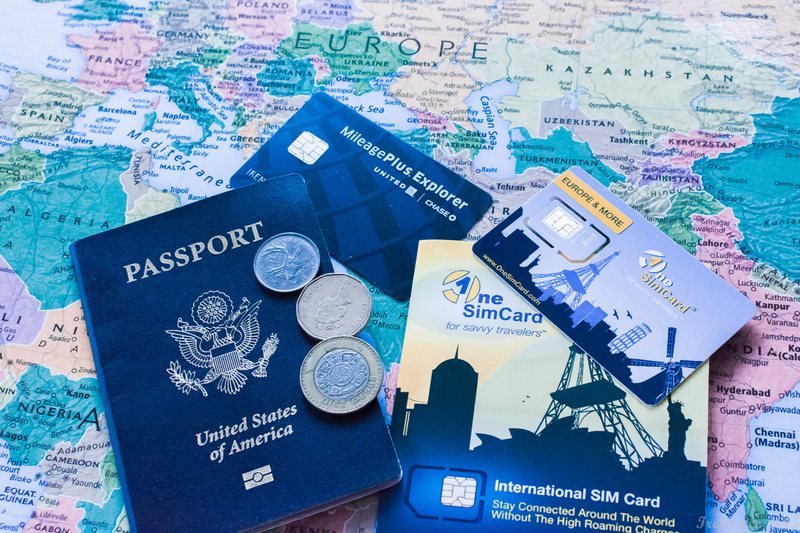 Billy also used their SIM cards for work related international trips to places outside of Europe. I tried simcardspain.com and it was a ripoff. I paid 35 Euros and I was supposed to have 2 GB of data and 60 minutes of calls. I ended up paying 8 Euros to make 3 calls that lasted less than 1 minute and never had data. No customer service. Stay away! If you try to use your cell phone without an international SIM card or a prearranged plan with your cell provider, you will bankrupt yourself. Claiming ignorance doesn’t work with them. The horror stories are all over the Internet. Try to get a return ticket that doesn’t require a change of flights. But if you can’t, and that’s the majority of us, be sure that your connection time is at least 2 hours. Depending on the time of day, time of year, etc. You could be the only planeload load going through Passport Control which means you could breeze through in a matter of 20-30 minutes. Or you could be one of several planes that just landed and be unlucky enough to have to stand in line for an hour or more. It happened to us one time when their computers were acting up and the line was moving like molasses in January. The first is Global Entry. This is for any international travel. The cost is $100 per person and you have to fill out an application, go through an extensive background check including fingerprinting, and an in person interview. If you are accepted, then you have the privilege of bypassing the regular line and going straight to a Global Entry kiosk. Answer a few electronic questions and move on. There’s an officer who will review your documents and waive you on. The second is NEXUS. This one is for people traveling back and forth between Canada and the US. If you are approved to participate in NEXUS, you will receive a radio frequency identification card to use when entering the United States and Canada at designated NEXUS air, land and marine ports of entry. The third one is SENTRI. This is for entry from Mexico and works the same as the NEXUS card. The fourth is FAST. This one is a combined one for Canada and Mexico. It seems to me that if you are going to be traveling often the best option is to just get Global Entry. It covers every country. These programs are for people who have spotless backgrounds. You will be denied a Global Entry card if you have ever been convicted of a crime (even juvenile criminal history is reviewed), or have a past issue involving customs inspectors. Obviously, if you are on a “watch” list you will be denied. But by all means, please do apply if you are interested. About 3-5% of applicants are denied every month. So now you cleared Passport control. While you were on the plane returning home you were given a blue customs card. This is where you declare what you purchased overseas. Only one per family is required. If you have nothing to declare then just say so. Read up on the State Department’s website to see what you are not allowed to bring back into the US. My forms never have anything to declare. I list what I purchased which is usually stuff like t-shirts, clothing items, jewelry, souvenir type of stuff. It’s usually always under $500 and we just breeze through customs. Only once have we been diverted to the line where they check your baggage. It was coming back from Hawaii I think? Maybe the Caribbean? I don’t remember. Not a big deal, they just run your checked bags through the x-ray machine and might open your luggage and search it for illegal items. They are looking for drugs, illegally obtained Ivory, agricultural stuff, body parts, etc. It’s not a big deal. Not a big deal that is, unless you lied on your declarations form. I don’t know what happens to you at that point but that’s one way to disqualify yourself from the Trusted Traveler programs. The last option for getting through CBP fast is the cell phone app called Mobile Passport. This is an approved CBP app that you can fill out your profile information ahead of time and keep it stored. As soon as you land and get a cell or WiFi signal you add your flight and arrival information, answer a few questions and hit submit. Within a few seconds you will receive a receipt and an encrypted bar code. You then have only 4 hours to use it. When you get the CBP line, you will see a sign that directs you to the Mobile Passport Control line. Show your bar code and US Passport to the agent (sometimes there’s a kiosk that will do the scanning) and you are on your way. The only glitch that we have come across is that the name on your ticket has to match perfectly with the name on the flight manifest. Some airline agents make entry errors that won’t keep you from boarding an aircraft but it will keep you from using this app. If that happens, you will be sent back to the regular Passport Control, but there’s a special line for Mobile Passport failures. so we just cut the line essentially. I hope this list is helpful. Just remember to apply for your passport a few months in advance of your international trip and get that Schwab card at the same time. I recommend visiting the US Centers for Disease Control (CDC) website and checking out what precautions you should be taking in terms of vaccines and known epidemics. Lots of good information on their international travel website. Vaccines are also a personal choice and one that we choose. At the very least we keep our Tetanus and Hepatitis A vaccines up to date. I also keep my Hepatitis B updated because of my occupation. So tell me what you think in the comments section below. Are you a frequent international traveler and have words of advice? Anything I left out that you have questions about? Don’t forget to sign up to get an email whenever I post a new article. See that link in the header, the sidebar, and the footer. This is a gem of an article! Much helpful information – feeds my wanderlust big time. Since I have never traveled outside of the US I have had many questions. Your article has helped me immensely with those questions. So, thank you for this and any further updated info you feel would help will of course be appreciated.